Born in 1992, in Germany. Niki lived in a German zoo, where there was no more place for her. Because her knees and vertebra were severely worn she was put to sleep on 18 April 2018. Born in 1989, in Russia. Mascha had to perform her tricks in the Russian State Circus from Moscow. Because her knees and elbows were severely worn she was put to sleep on 28 June 2017. Born in 1989, in Bosnia. Mackenzie came from the warzone in former Yugoslavia. His name derives from the commander of the UN troops who liberated him, Lewis Wharton MacKenzie. Mackenzie suffered form osteoarthritis and could hardly walk. He was put to sleep on 8 June 2015. Lived in a zoo in Rustavi, Georgia, that had to close down. Threatened to be put down, but saved and flown to Holland in 2007. Came to the Bear Forest with Duuk and Igor. Suffered from osteoarthritis. He was euthanized on 2 February 2015. Born in 1975, unknown origin. He started his life on a Russian ship and was used as the ship's mascot. Geert was seized by customs and brought to Ouwehand Zoo in 1975. When the Bear Forest was completed in 1993, Geert was one of its first residents. He died on 7 June 1999. Born in 1974 in Germany. She came from a zoo in Frankfurt, Germany. She lived in Ouwehand Zoo from 1975. Trudy lived in the Bear Forest from July 1993. She died in July 1994. Born in 1973 in Croatia. She was owned by Gypsies and lived most of her life as a dancing bear. She was later seized and taken to Split Zoo in Croatia. Nelly lived in the Bear Forest from July 1993. She died on 29 July 2004. Born in January 1968 in the Netherlands. He lived most of his life in the infamous bear pit in the city of Maastricht, the Netherlands. He was brought to the Bear Forest in August 1993. Jo died in February 1997. Born in 1974 in Russia. He was rescued from the Russian State Circus in Moscow. Batir was brought to the Bear Forest in May 1994. He died in October 2001. Born in 1990 in Turkey. He began his life as a dancing bear in Istanbul. Bora was rescued in October 1993. Bora was brought to the Bear Forest in August 1994. He was blind. He died in June 2006. Born in 1976 in Turkey. Like Bora, he began his life as a dancing bear in Istanbul. He was rescued in October 1993. He was brought to the Bear Forest in August 1994. He was also blind. Koröglû died in July 2006. Born in 1978 in Turkey. Like Bora and Koröglû, she began her life as a dancing bear in Istanbul. She was rescued in October 1993. She was brought to the Bear Forest in August 1994. She was also blind. Fiona died on April 22, 1999. Born in 1993 in Germany. Axel was the brother of Tory and Wolke and all three bears were seized by German officials from a German circus. He came to the Bear Forest in November 1994. Axel died in March 2002. Born in 1964 in Russia. Fenja was taken from the forest as a cub and was used most of her life as a star in Russian films. She came to the Bear Forest in August 2000. Fenja died on 20 June 2005. Born in 1991 in Russia. She lived in the basement of a Russian university and was going to be used for experiments. Fortunately she was rescued. 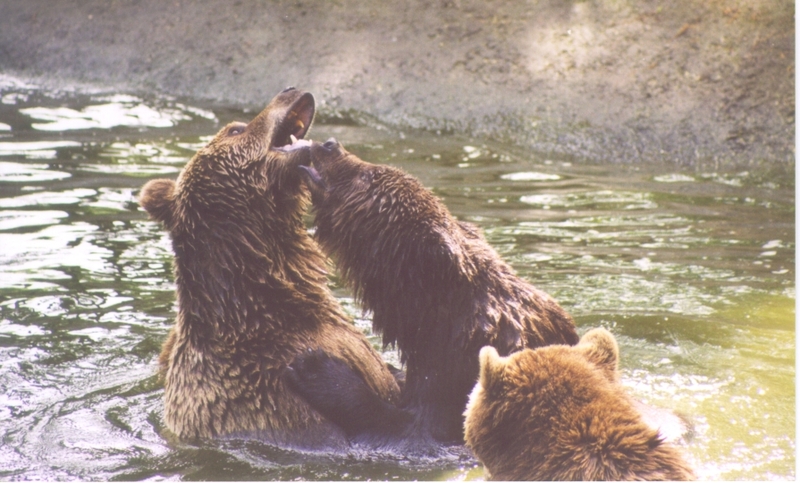 Ljalja was brought to the Bear Forest in August 2000, together with Fenja. She was moved to another Dutch zoo 'Dierenrijk' on November 12, 2003. She still lives there. Born in 1998 in Slovakia. Brigita was taken from the wild because she was a so-called 'nuisance bear'. She would have been euthanized by the government. She was temporarily brought to the Bear Forest in May 2003. Brigita was moved to 'Dierenrijk' together with Ljalja on November 12, 2003. She still lives there. Born in 1982, unknown origin. Bruce came from a circus with bear Ronja, but ended up in a horrible shelter in Spain. He lived in the Bear Forest since December 2009. Bruce died in June 2011. Like Bruce, she came from a circus, but ended up in a horrible shelter in Spain. She lived in the Bear Forest since December 2009. Ronja died in December 2012. Born in March 2004 in Spain. He is one of the two offspring from Bruce and Ronja. Pepe came to the Bear Forest in December 2009, but moved to Tierpark Pössen in Germany shortly after. He still lives there. He is one of the two offspring from Bruce and Ronja, and brother of Pepe. Pedro came to the Bear Forest in December 2009, but moved to Worbis bear sanctuary in Germany shortly after. He still lives there.